Usenet: Everyone's heard of it, nobody uses it. This is ridiculous. Not only is it a fantastic way to download—it's not that hard to use. Here's how to drop your torrent habit once and for all, with Usenet. This point of this guide is to get people acquainted with the basics of Usenet, but if any of you beardy old-timers have any tips, tricks, advice or tearful memories to share about your decades on the 'Net, that party's in the comments. Anyway! I'll spare you a deep historical and technical explanation, because it'd bore you to death, and I'm not the guy to give it: Usenet has been around since the late 70s as one of the bulletin board systems that the first generation of true nerds cut their teeth on. It was designed for discussion, and lived across tons of decentralized servers. For most purposes it's been replaced by the internet as we know it today, but it's still very much alive, albeit with a different face. You see, somewhere back in the 80s, someone started uploading binary content—files, not words—to Usenet. This was, and in some ways still is, an awkward fit, but it quickly became one of the main uses for the service. Why? Because nobody seemed to care much about regulating it—they still don't, for whatever reason—and because, man, it was fast. These factors made it a perfect refuge for for files of all types, and now the pure amount of stuff available on Usenet rivals—and in a lot of categories, exceeds—the best torrent trackers, which are getting picked off anyway. This one's easy: Aside from serving a huge amount of content, Usenet is usually the first place popular downloads show up, and unlike torrents, once they're up, the downloads immediately run at full speed. Speaking of which, it bears repeating: Usenet is extremely fast. Unless your service is absolute crap, you're probably going to max out your broadband connection. Once you've tasted this kind of speed, torrents almost seem silly. And lastly, you don't have to seed, or upload, anything. There was a time when ISPs weren't just cool with Usenet binaries—they actually hosted them. Some still do, but in those rare cases there are usually crippling bandwidth restrictions, throttling measures and all kind of missing content. To mine the Usenet gold you really care about—the alt.binaries content—you're going to need to buy access. Sorry! Usenet isn't a peer-to-peer service, so you've got to pay someone, somewhere for all that bandwidth and storage. The good news is, you can get away with spending about $15 a month for unlimited, unthrottled access. If you're not comfortable with this, get your feet wet with a free trial, like GigaNews', or just buy a one-off download pass, good for a few gigabytes. There are a couple things to look for in a Usenet provider, but most major, reputable services are roughly comparable. Retention is a word you'll see a lot: Usenet servers, given the pure volume of content they get loaded with, have to clear themselves out every once in a while, meaning that files have a limited lifespan. Retention is just a term to describe how long a provider can afford to keep uploads, and the longer they can hold onto uploads, the more files they have. You shouldn't settle for much less that 300-day retention nowadays. Providers also advertise how many parallel connections to their servers they permit at one time. More=faster, but past about ten concurrent downloads, the numbers really stop meaning anything, unless you're on some kind of insanely fast commercial connection, in which case WHAT ARE YOU DOING DOWNLOADING FILEZ, HMM? Lastly, there are download limits. This should be more obvious, but just just in case: This represents how much you can download from your provider in a given month. This one's all you, so if you really don't think you'll break 10GB a month, only buy 10GB a month. Once you really start to kick your torrent habit, though, you might be surprised at what you're capable of. I've been using Astraweb for years—they're cheap, and fast enough to saturate my connection—so the rest of the tutorial will assume you've chosen them. If you've gone with another provider, the only difference will be your server settings, which they'll give you after you sign up. Remember: Usenet servers are all meshed together, so no matter who your provider is, the available downloads should be about the same, at least for as long as your provider keeps them around. As with torrents, there's some pretty weird stuff going on behind the scenes with Usenet. As I mentioned earlier, adding binary files to Usenet was kind of an afterthought, which means the procedure for downloading them kind of complicated, at least on the back end. For example: Usenet binaries have relatively low size limits, so any larger content—movies, software, etc—needs to be split up into lots of small pieces. You know how sometimes a torrent comes in about about 40 .RAR files that have to be rejoined once they're downloaded? That's because it came from Usenet, where files can't be much more than 20MB. So, your client's got to be able to handle all these group downloads, and preferably join them together for you automatically. There a plenty of Usenet clients out there, but most of them are either don't support the kind of file downloading we want—your email app probably falls into this category—are command-line-based, or cost money. 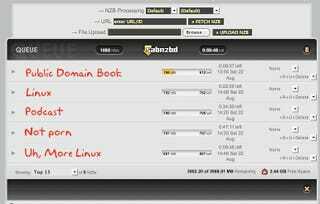 I'm done spending your dollars for today, so I'll point everyone toward the only free, cross-platform Usenet binary client I know of, and one I've been using for quite a long time: It's called SABnzbd. The rest of the guide will be based around this app, though you can try to follow along with some other free alternatives if you like. Mac OSers may want to try Hellanzb (GUI version linked) and Windows folks could go with Alt.binz. But SABnzbd is, to put it bluntly, pretty great. SABnzbd runs a local web interface, so it'll look the same no matter what OS you're on. Here's how to get started. 2.) Start it up. It should open a browser window to a control panel-esque page, clearly label as SABnzbd. 3.) Navigate to the "Config" Page and click "Servers"
5.) Staying in the "Config" page, click "Folders"
6.) Choose where you want downloaded files to go, and where you want the temporary files to live before they're finished downloading. 7.) Choose a "Watched" folder. This how SABnzbd will know what you want it to download. Make it a place that's easy for you to save to, from a browser. That's it! Now just leave SABnzbd running, and we'll start to explore Usenet. Feel free to play around with more of SABnzbd's options, like the themes, one of which is featured on this article's top image, but follow this general rule: if it's not totally obvious to you what an option changes, you should probably ignore it. The only thing you might have to worry about outwith this setup procedure is enabling an SSL connection, if your ISP is throttling your download speeds. More on that here. Now that you've got access to Usenet, and the right tools to draw those sweet, sweet files from it, it's time to dive in. Since Usenet in the raw is an incomprehensible mess, something has emerged called the Newzbin, or NZB standard. NZBs are a lot like torrent files: They're little pointers that contain information about all the little scattered pieces of a given download, and which give clients like SABnzbd everything they need to make downloading look seamless to users. To "explore Usenet" is really to explore indexes of NZBs, and to do that, you need a good search engine. The best is at Newzbin, from the people who invented the NZB format. Unfortunately, it too is paid, and currently invite-only. Instead, you should use one of the decent free alternatives, like NZBs.org, Binsearch or Newszleech. Searching takes some practice, but once you get a sense of how people name stuff 'round these parts, it's a breeze. It's working! And yes, it's really going that fast. If it's not downloading, you may need to check your server settings: Sometimes ISPs block the default port, 119, meaning you'll have to use another one that your provider supports. 8080 is a common one, as is 1818. Refer back to step four for this; changing it should only take a second. SABnzbd takes care of all that nasty .RAR rejoining and extracting for you, so once the download is done, your designated download folder should have a fully-cooked, ready-to-watch/listen/run file waiting for you. Bask in it. As you've probably guessed by now, there are a lot of ways to make SABnzbd more powerful. For that, have a look at this fantastic thread on SomethingAwful by one of the app's developers, and the SABnzbd wiki, which answers just about any support question you might have. Also, there's a big subject we didn't even address here today, which is how you actually add stuff to Usenet. The process can be a little involved, and hey, you're brand new to the world of Usenet—let the rest of us worry about uploading for now. That said, when you're finally ready, here's a primer. So that's about it! Please add in your experiences in the comments—your feedback is a huge benefit to our Saturday guides. Happy torrenting Usenetting, and have a great weekend!